In The Force Awakens, while having her meal next to a fallen AT-AT, Rey put on a rebel pilot helmet. Whose was it? 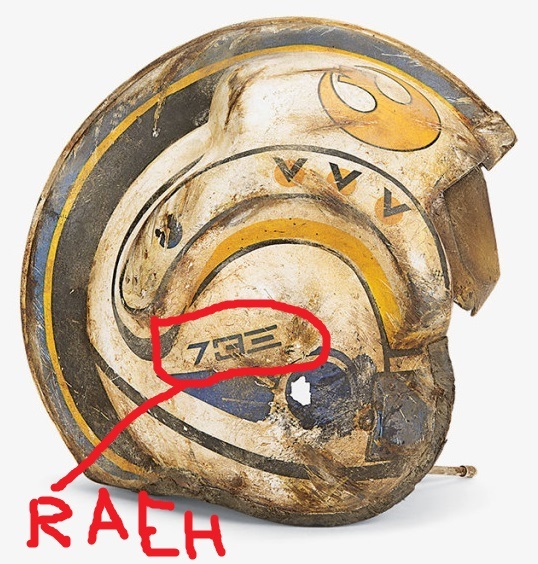 It seemed to have "Ræh" written on it, in Aurebesh... Did the helmet belong to someone she adopted her name from? 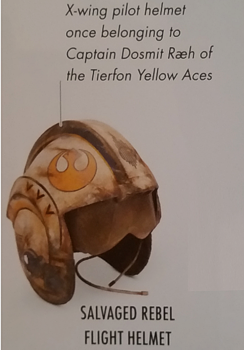 The helmet belongs to a rebel pilot called Captain Dosmit Ræh, a member of an elite fighter squadron called the Tierfon Yellow Aces, hence the instantly recognisable yellow sigil. Her X-Wing, (callsigned 'Yellow-4') crash-landed on the planet during the Battle of Jakku and was salvaged by Rey along with a variety of survival gear items found in her ship's storage locker. Beyond that, nothing is known of Captain Ræh other than that her ship crashed on Jakku. The fact that her ejector seat had been fired (and that the canopy was missing from her X-Wing and that her helmet was found at the crash site) strongly indicates that she almost certainly survived the initial impact. As regards whether Rey chose her name to honour Ræh, there's absolutely no indication that that's the case. 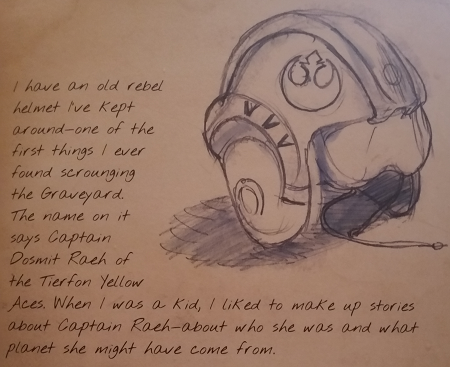 The helmet belonged to a rebel pilot named Dosmit Ræh. The Aurebesh alphabet translated into English below. I circled the ones on the helmet to make it clearer to see. You can see that the helmet has the letters, Resh, Enth and Herf Which translates into 'RAEH'. I should also mention that the insignia is from the Tierfon Yellow Aces which she was a part of. How do ejection systems operate for Rebel pilots? 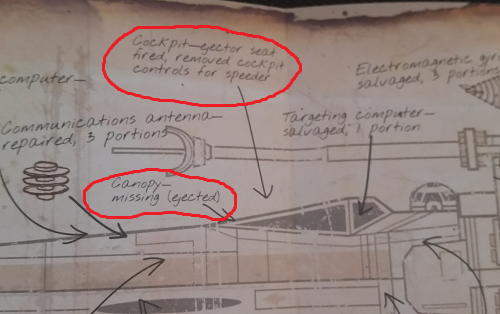 What was the initial escape ship of Rey and Finn?